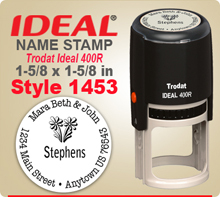 Select a free logo art image for your Ideal 400R Name Rubber Stamper. Choose from 99 logos that were made in Adobe Illustrator®. These images will make great impression on your Self Inking Ideal 400R Rubber Stamp. Click the link. Choose a logo. Enter the number of the logo into the entry area provided. Your last name will be entered as shown in example.These name stamps are 1.5 by 1.5 inches round Ideal 400R Stamps have smooth action. You will like your choice here. If order is placed by 4 PM Central your Name Rubber Stamper will ship next day.